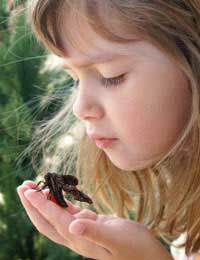 It's never too early to help your child develop a closer relationship with nature. Even small babies love being outside in the fresh air, while toddlers can't wait to explore the world around them. Developing a love of and respect for nature is important, and it's never too early - or too late, for that matter - to learn. Young children are fascinated by watching ants at work, and summer is a fantastic time to teach your kids about the ant world. Watching a real ant colony is fun and a great way to start explaining how the insect world really works, and you may find yourself having to buy an ant farm before too long! Toddlers find it easy to tune in to the world inside their gardens – especially in summer when they're full of nice, juicy bugs. Spend an afternoon exploring the bugs in your garden, and bring along a notebook so your toddler can make drawings of what he or she sees. The best way for them to appreciate all the insects up close, of course, is to make a Bug Hotel (you can release the little critters later). Very young children find it easier to give their “pets” back, so hopefully that won't be too hard. Babies love going outside, and if you put them in a front-facing sling they can enjoy trying to make sense of the world around them. Pointing out different things you see and encouraging them to explore textures and feel different surfaces can help get them interested in things outside their immediate surroundings. Talk to them about what you see and explain what they are touching – you'd be surprised how much even small babies understand. For older toddlers, combine visual exploration with making rubbings with paper and crayons of interesting and unusual surfaces, such as special stones and bark. Many children these days believe that carrots, onions and beans “grow” in the supermarket. Assist your child in understanding how vegetables grow by encouraging them to take part in a spot of gardening for themselves, seeing how nature really works – with a little help from us. Kids can begin by helping to dig holes and placing seeds in the ground. They will also love watering plants, but don't let them go overboard and drown everything out! If you don't have a garden, you can try growing herbs on a pot in the windowsill. Alternatively, plan a trip to an allotment so they can be an eye-witness to veggies actually coming out of the ground. Understanding nature in all its many forms is something we never get tired of. Even babies can appreciate the Great Outdoors, and teaching toddlers about how we live is an important part of the learning process. Make it fun, and you can't go wrong. They won't even realise it's educational!